In the Under 15 Girls (P15) Teaml category, WPKL looks set to defend its Gold medal. 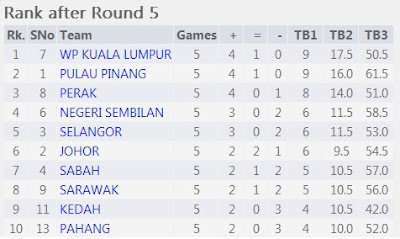 As per GiLoCatur understanding, even Perak who will challenge WPKL in the final round wins by 4 - 0, WPKL will still be the champion since its TB2 will still be higher. The Board 2 match up between Pulau Pinang and Selangor is crucial. It may determine both 1st and 2nd runner up in the category. Selangor led by Anis Fariha must win by 2 1/2 -1 1/2 at least to secure the second position. In the Individual event of Under 15 Girls (P15), Selangor may get its Gold medal through Nur Najiha who is currently the leader with full 5/5 points. A draw is enough for her to become the champion. Her opponent is her Selangor team mate, Puteri Rifqah. On Board 2, Nur Sabrina Aliya from Pahang will challenge Li Tomg (should be Li Ting, typo error. thanks to the reader who just highlighted about it. corrected on 30/03/13, 1.10pm) from WPKL. It is an interesting battle in the Under 15 Boys (L15) Team category. 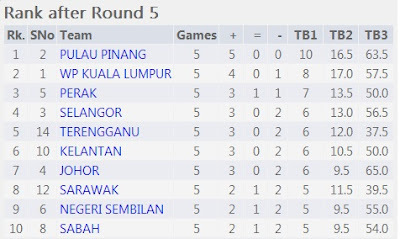 Pulau Pinang which is the current sole leader with nine (9) match points is paired against Selangor which shared match points with WPKL. WPKL is hoping Selangor to win over PP to give it the chance to become the champion. For sure, PP will defend its Gold medal and does not let Selangor spoil their victory. What the outcome will it be? Let's wait until the sixth round is over. In the Individual L15 category, Selangor is hoping its player, Li Tian, to provide a Gold medal. He is currently the sole leader with full 5/5 points. Subramanian of Negeri Sembilan will be Li Tian's final opponent in the 2013 MSSM chess competition. Meanwhile, Harleiff Haniff will be the best bet for WP Putrajaya to win the Top 3 medal. He plays black against Ahmad Zahir of Perlis. GiLoCatur's medal prediction for Under 15 category >>> SEL - 2, PP - 1 & WPKL - 1 Gold medals. The 2013 MSSM chess championship is going to end soon. The final sixth round will begin in about seven hours. So, how is the standing so far? Let's begin with the Under 12 category. In the Individual L12, Amier Hamzah of WPKL is currently the sole lead. He is in the better position to contribute the Gold medal to his state team. He is paired against Hazid Ekquan of Pahang at the top board. While Yinn Long of Pulau Pinang will play white against Selangor player, Praghashkumar of Selangor at Board 2. 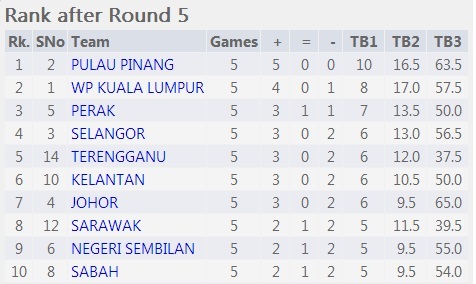 In the Team L12 event, Pulau Pinang has two match points advantage over WPKL. The former will play against Terengganu while WPKL will be challenged by the host team, Perak. A draw is enough for PP to grab the Gold medal in this category. In the Individual P12 category, Pulau Pinang is leading through its player named Teh De Zen. She edged Selangor player, Puteri Munajjah, in the fifth round. In the final round, De Zen is paired against another Selangor player, Maisarah while Puteri Munajjah will be challenged by Amy Halida. In the P12 Team event, it is the battle between WPKL and PP. Both teams have same match points. WPKL has the advantage since its TB2 (Tie Break 2) is 1.5 points more than PP. GiLoCatur's prediction for the Under 12 category, WPKL - 2 Golds, PP - 2 Golds! The MSSM chess championship is halfway. Three rounds had completed. Three more rounds to go. So, what's happening? Is Selangor or Wilayah Persekutuan KL (WPKL) or Pulau Pinang on right track winning their targeted Gold medals? Let's take a glimpse on the results thus far. In the Boys section, WPKL team was the champion for the past two years. But this year, based on the list of players, GiLoCatur predicts that Pulau Pinang (PP) will become the champion. The actual results thus far, both WPKL and PP are the only teams which won all their three rounds. In other words, both teams have the perfect 6 six (6) match points. But WPKL is leading the group because it has better game points i.e. full twelve (12) game points compared to PP. In the fourth round these two teams will play each other. What is the result gonna be? A win by either team or a draw? In the Girls section, PP is the defending champion. If they win this year, it will be a hat trick. But at the moment, PP is trailing WPKL two (2) game points even though both teams have same six (6) match points. Like in the Boys section, WPKL and PP will also play each other in this category. In GiLoCatur's opinion, both teams have equal chance to win. How about the Selangor (SEL) team especially in the Boys section where GiLoCatur's son is playing? After losing to PP in the third round, SEL needs to win the next three rounds in order to be on the podium. Its fourth round opponent will be Pahang. In the Boys section, WPKL is leading right now with maximum match points. PP as the defending champion was held to a draw by Johor. While Selangor could only get half point playing againts WPKL in the third round. 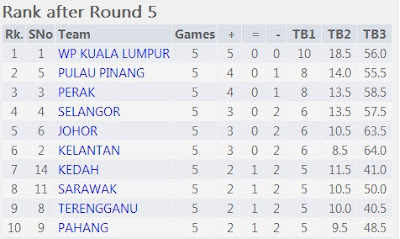 In the battle of top two boards in the fourth round, WPKL will play PP while Johor will play Selangor. In the Girls section, the Selangor team had also the same results as its Boys team playing against WPKL. Both WPKL and PP are the current leaders in this category. Their fourth round match up will be a tough battle. GiLoCatur strongly believes that the winner will emerge as the champion. In the Boys section, both WPKL and PP are the current leaders. WPKL defeated Selangor while PP defeated WP Labuan with the same score of 3 1/2 to 1/2. Yet another WPKL and PP match up in this category. In the Girls section, PP is the sole leader. Both Kelantan and Selangor are trailing half point. PP will play against Selangor while WPKL will be challenged by Kelantan. It will be tense battle in the team event especially to both WPKL and PP. They will play against each other in all categories except P18. GiLoCatur has to sign off now to get rest for the fourth round in less than six hours. As in Spanish, "asta manyana" or see you tomorrow. 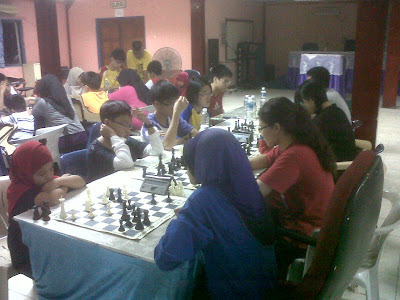 Alhamdulillah, this year all the three of GiLoCatur's children are taking part in the MSSM chess championship. Two of them - Anis & Fahim, are playing for Selangor while their elder brother, Fikri, is with Wilayah Persekutuan KL team. All of them are playing in the team event in their respective category. Fikri in Under 18 Boys or L18. Anis in Under 15 Girls or P15. And Fahim in Under 12 Boys or L12. Like last year, Anis is leading her team on Board 1. Two of her team mates last year - Ee Sun Xin and Nurul hana Syuhada Sulkifly, are still with her. Her new team mate this year is Nur Anisah Salihin. In the first round, Anis and her team mates faced Wilayah Persekutuan Labuan. Fikri and his other three team mates - Tan Jun Feng, Liew Ken Yew and Albert Ang Keliang, has to defend their Gold medal last year. If last year, Fikri was playing on the last board, this year he plays the third board. Fikri and his L18 team played against Kelantan in the first round. Can Fikri and his team mates win Gold medal again this year? We'll know by Friday afternoon. Fahim makes his debut appearance in the MSSM chess competition this year edition. He plays the third board like his elder brother. His team mates are Yee Jian Yang, Emir Rusyaidi Bin Ahmad Nazari and Ahmad Danial Aqil Bin Salihin. Their first round opponent was WP Labuan. Last year, the Selangor L12 team won the Bronze medal. Can Fahim and his team mates emerge as the champion this year? They can if able to beat both Pulau Pinang and Wilayah Persekutuan KL. Most gracious to Allah, all the three children of GiLoCatur won their respective matches. Furthermore, all their teammates won too. It means that they won convincingly with the score of 4 - 0. Hopefully, the winning will continue in Day 2 on which two rounds will be played. Good Luck, my beloved children! And HAPPY 11th BIRTHDAY, Fahim! 25th March 2013, Taiping - The MSSM chess championship for 2013 edition kicked this afternoon. 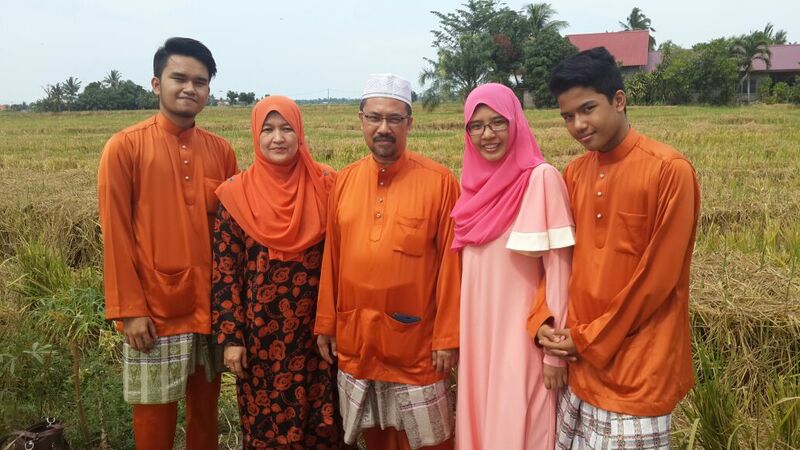 GiLoCatur and wife left home at Shah Alam at around 8.00 o'clock in the morning. We arrived at Taiping located in Perak state three hours later. We drove around Taiping town looking for the hotel for the stay and cake shop. Fahim's 11th birthday is today. He wanted to have a birthday celebration with his Selangor team mates. Before that both GiLoCatur and wife stopped by at Taiping Perdana Hotel, the venue of the championship. Below are few photos that GiLoCatur snapped while at the hotel. 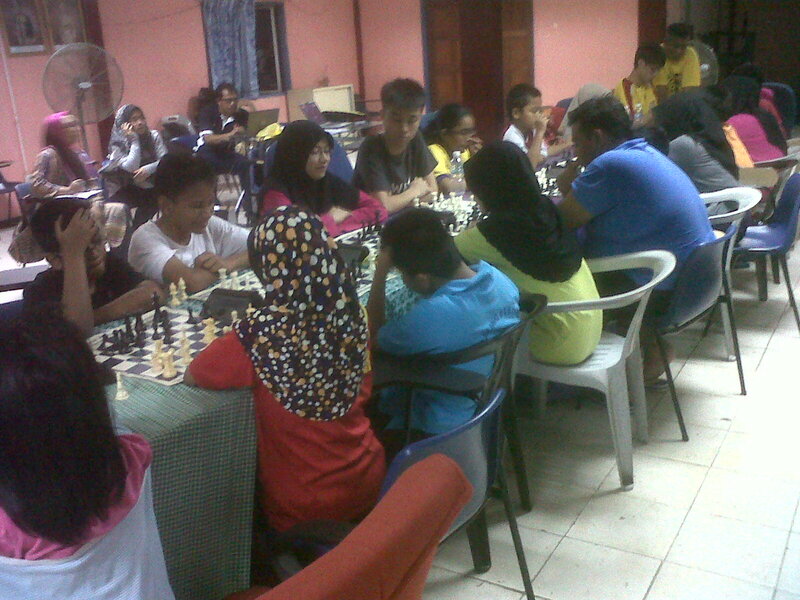 Selangor Chess Contingent Trains Hard for MSSM 2013 Taiping! It is about two hours into Sunday, 24th March 2013. GiLoCatur believes that all the state chess contingents had arrived in Taiping, Perak. The first round of the championship will kick off at 2.30pm on Monday, 25th March 2013. This year edition will be the fifth for GiLoCatur to be part of. 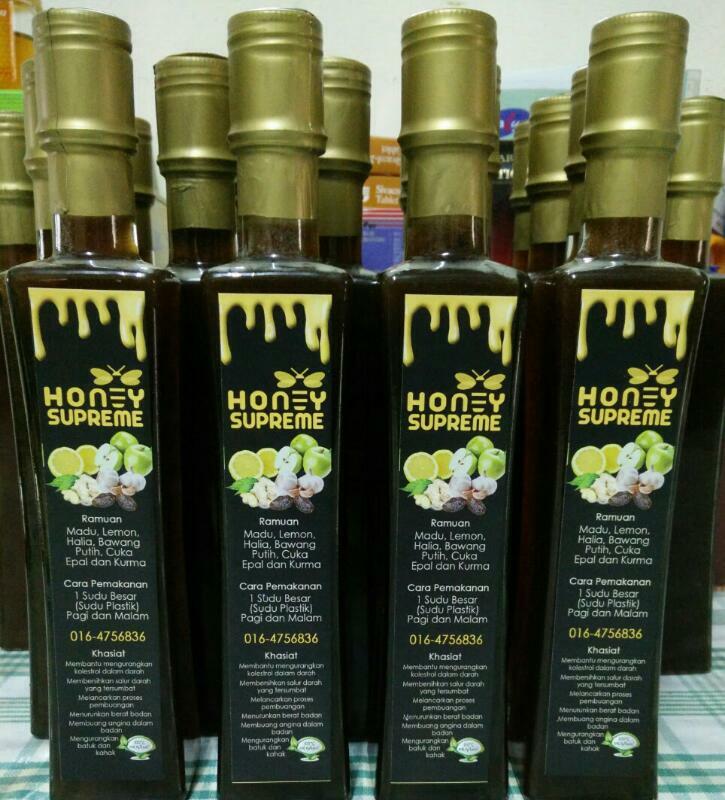 The first one was the year 2009 edition held in Kelang, Selangor. It was in that edition that GiLoCatur's only daughter, Anis Fariha, made her maiden appearance in the MSSM chess championship. Alhamdulillah, this year all the three of GiLoCatur's children - Fikri, Anis and Fahim, will take part in the championship. It will be the first time that all of them are in the championship. And it will also be the last time. 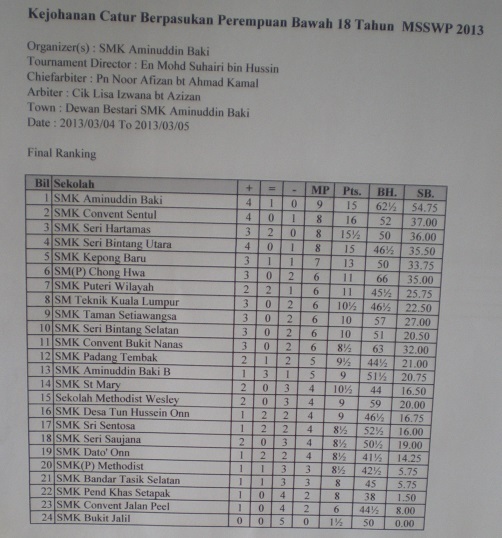 The reason is because Fikri will play for the last time in the MSSM chess championship since he is in Form 5 this year. Following closely the championship for the last five years, GiLoCatur can conclude that there are three states namely Selangor (SEL), Pulau Pinang (PP) and Wilayah Persekutuan Kuala Lumpur (WP) that dominate the championship. Let's take a look at the Gold medal tally for the last two years - 2012 amd 2012. Basically, there are six Gold medals up for the grab in both Individual and Team events each meaning the total number of Gold medals are twelve (12). In 2011, the three states mentioned above won ten out of the total twelve Gold medals. WP won four (4) while both Pulau Pinang and Selangor won three (3) each. The other two Gold medals were won by Kedah and Melaka. 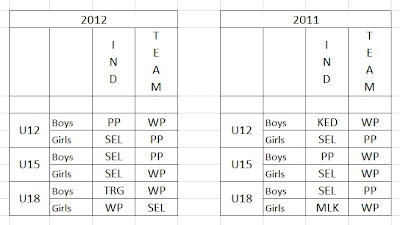 The former won U12 Boys Individual category while the latter won U18 Girls Individual category. While Selangor won all its Gold medals in the Individual events, Wilayah Persekutuan won all its Gold medals in the Team events. In 2012, both Selangor and Wilayah Persekutuan won four (4) Gold medals each. Pulau Pinang won one less while the host state, Terengganu, managed to win one in U18 Boys Individual category. So, what the medal tally would be in 2013? Any prediction? GiLoCatur plans to publish his prediction once he has seen the list of participants in each category. What's your January 2013 national ratings? GiLoCatur's is 1428. 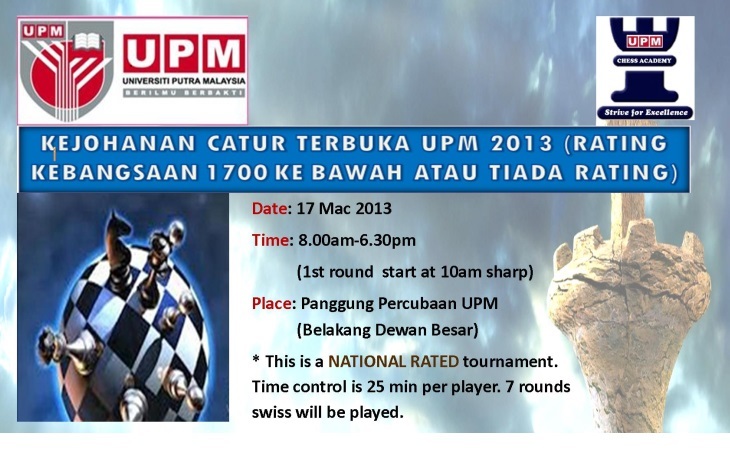 That's mean GiLoCatur is eligible to take part in the nationally-rated UPM chess open to be held this Sunday. GiLoCatur can't wait to play chess in local tournament since the last one was about six weeks ago. Have you registered? GiLoCatur just sms-ed to register for the tournament a short while ago. The deadline for the registration is today, 14th March 2013. After this date, you still can register BUT you will have to pay more for the fee. OR your registration may not be accepted because the limit number of participants has been reached. Only Fahim will join GiLoCatur in the tournament. Both Fikri and Anis will not be playing since they are not coming home this weekend. To register, please sms your name to either Chek at 014-3276155 or Khoo at 016-8023844. Or you can also register via facebook. The facebook link is here. The MSS chess scholastic championship for the state of Wilayah Persekutuan Kuala Lumpur (WP KL) just concluded last Friday. It was held at the hall of SMK Aminuddin Baki. Who are the champions? In the Girls division, SMK Aminuddin Baki of Pudu Zone managed to pip SMK Convent Sentul of Sentul Zone in the final round to emerge as the team champion. While in the Boys division, SMK (L) Methodist of Bangsar Zone is crowned as the champion after securing 4 wins and a draw. Their four wins include 2 1/2 to 1 1/2 victory over both SMK Aminuddin Baki and SM Sains Alam Shah. Today is Friday, 8th March 2013. It is the final and penultimate day for the MSSMKL chess championship of 2013 edition. The final sixth round of the individual event is entering the final hour. So, what's the latest update? Who has the best chance to emerge champions in four categories - L15, L18, P15 and P18. Let's take a look. Faizal Roslan and Dilwen are the only perfect scorers left. Their match up on the top board most probably will determine who is going to become the champion. Playing white Faizal from SMK Seri Bintang Utara won over his opponent Dilwen from Sekolah Methodist Wesley. Shreyes, who is the only player trailing halfpoint, was held draw by Lim Ming Xian of SAB. In the final round, Faizal will play black against Shreyes. Can the latter hold the former to a draw? Then the champion will be decided by tie break. The current leader in this category is Liew Ken Yew from SMK Seri Bintang Selatan. By Round 4, he won all his games. He was paired against Tan Wei Hao of SMK(L) Methodist in the fifth round. The former continues his winning streak. In the final round today, he is challenged by Albert Ang Keliang, the school mate of Wei Hao. While the top seed, Tan Jun Feng, is paired against his school mate, Chan Yan Meng. Both need to win to earn better placing. Fikri from SM Sains Alam Shah has to face Yap Wan Lin from Sekolah Sri Garden at table 5. Both have 3.5/5 points. The host school, SMK Aminuddin Baki, is depending on Tan Li Ting to give them the Gold medal in P15 category. She is leading the section by one full point. Her final hurdle is long-time mssm team mate, Camilia Johari from Sekolah Seri Garden in the final round. A draw is enough for her but GiLoCatur believes that Camilia will go for a win. Li Ting's younger sister, Wei Ting, can be among the Top 3 winners if she wins in the final round against her opponent from Sekolah Methodist Wesley, Wong Zi Qi. Another SAB player, Kashmira, plays white at table 2 against Nutul Aina Akmar of SMK Seri Bintang Utara.What the results would be? Interesting result happened in P18 category. The top seed player had her first defeat to her CBN (Convent Bukit Nenas) opponent. Now the other hot favourite, Latifah Kaiyisah of SMK St John, will face Siti Nadia Qarmila from CBN school at the top board. Kaiyisah has the edge to win over her opponent and emerge the champion in this category. Can she win? Let's wait to find out. It is less than 15 minutes before the 2013 MSSMKL chess championship is going to be over. And it may be the last time for GiLoCatur to be at the MSSMKL state chess championship since Fikri will leave school at the end of this year. Or Fahim may be schooling in KL? Wallahua'lam. Wednesday, 6th March 2013 - The individual event of the 2013 MSSMKL Chess Championship began today. 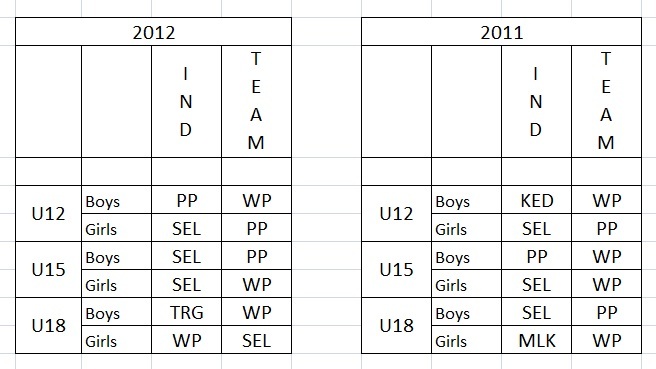 There are four categories competed for the event - Boys Under 15, Boys Under 18, Girls Under 15 and Girls Under 18. Two rounds were scheduled for today. And three more will be scheduled tomorrow on Thursday, 7th March 2013. The format of play is 60-minute per player. Forty eight players are taking part in this category. Click here to view the first two rounds pairings and results. The top three seeded players are Faizal Roslan of SMK Seri Bintang Utara, Shreyes Subramaniam of SMK (L) Methodist and Tan Yong Zhao of SMK Kepong Baru. So far, the three of them do not have problem winning their first two rounds. Only forty six participants are contesting in this category. You can view the pairings and results of both Round 1 and Round 2 here for this category. Two Tans are the top two ranking players in this category. The top seed is Jun Feng of the host school i.e. 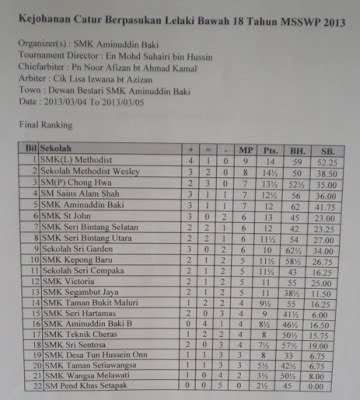 SMK Aminusddin Baki while the second rank player is Wei Hao of SMK (L) Methodist. The third rank player is Liew Ken Yew of SMK Seri Bintang Selatan. GiLoCatur's son, Fikri, is ranked fifth with national ratings of 1630. All the four of them have no trouble today in both the first and second rounds. While her elder brother is the top seed in the Under 18 Boys, Tan Li Ting is the top seed in the Under 15 Girls. As her brother too, she represents the host school. In fact, her younger sister Tan Wei Ting is also playing in the same category. She is ranked sixth. Here is the pairings and results for this category. Is there any upset result? Check it out! 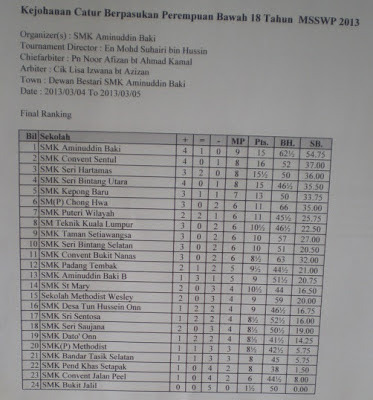 In this category, a player from SMK Convent Sentul is the top seed. Her name is Pavitranayagi Jayamurthey. She is being challenged by Latifah Kaiyisah Mohd Latib and Yap Ern Yee respectively of SMK St John and SM (P) Chong Hwa as the second and third seeded players. What are their first two rounds results? Find it out here. The team event of the MSSMKL chess championship had just completed today. Five rounds had been played - two yesterday and three today, 22 teams in the Boys section and 24 teams in the Girls category. So, the results had been known. Which team had emerged as the champions? The hot favourite team, SMK (L) Methodist, emerged as the champion in the Boys section. It thrashed four teams including both SM Sains Alam Shah led by Fikri Saleh and SMK Aminuddin Baki led by Tan Jun Feng before it drew with its last opponent, SM (P) Chong Hwa. The first runner up was won by Sekolah Methodist Wesley with 8/10 match points. Three teams shared 7/10 match points. Therefore, their placings between third and fifth are determined by the game points tie break. The host team, SMK Aminuddin Baki, led by Tan Li Ting managed to stop SMK Convent Sentul led by Pavitranayagi, from being the champion in the Girls section. In the final round, the latter which had won all its previous four rounds was beaten by the former which had won three and drew one. SMK Convent Sentul was lucky enough to have higher game points so that it was declared the first runner up over two other teams with same 8/10 match points. SMK Seri Hartamas edged SMK Seri Bintang Utara to the second runner up position by just mere half game points.SMK Kepong Baru was fifth after scoring 7/10 match points from three wins and one draw. SM Sains Alam Shah was lucky enough to win its final round when playing against SMK Kepong Baru. After the first three boards completed their games, the results was 2 to 1. The last board was still paying. GiLoCatur thought it would be a draw where SMK Kepong Baru's 4th board player would win since he is a stronger player and has higher ratings. But when the game was over, the point was won by the SM Sains Alam Shah's player. What a sweet victory for SM Sains Alam Shah chess team. With the 3-1 win, the team had secured the fourth placing. "FIGHT TILL IT AINT OVER", right? A Big Congratulation to all the winners! This week the state final for MSSMKL chess championship is being held. The secondary schools category is hosted by Sekolah Aminuddin Baki like last year. The first two days is scheduled for team event. While the individual event will be contested on the last three days. GiLoCatur's eldest son is participating in the championship. It will be his last in MSS chess championship since he is in Form 5 this year. He is leading his school chess team in the team event. The team has a big challenge to carry since SMS Alam Shah is the first runner up last year. Can Fikri and his team mates - Wan Muhammad Imran, Mohd Sazlee Hidayatullah and Hussein, repeat the feat to be among the top three winners this year? Let's wait until tomorrow after the event has completed. 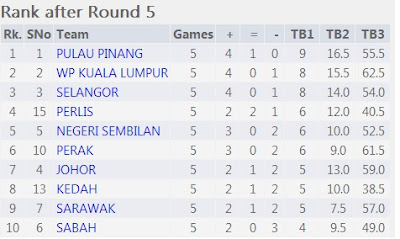 Not only due to SMS Alam Shah's first runner up position last year that it is being on the opponents team radar but its status as the champion in the Pudu zone chess championship fortnight ago that add the pressure. Fikri and his team mates need to manage and handle the pressure well. It is part of the competition. And for sure, it is part of life. Which team is the hot favourite to be the champion in the Boys category? GiLoCatur picks SMK (L) Methodist as the hot favourite. The team is actually the defending champion. The team consists of Tan Wei Hao, Albert Ang Keliang, Yap Egin and Shreyes Subramaniam. In the first round, SM Sains Alam Shah faced SMK Sri Sentosa. It won with the score of 3 to 1. Its opponent in the second round is really the toughest one. It is the hot favourite team. Sure you can guess what the team is, right? Check out http://mssm2010.blogspot.com/ blog here if you want to know the the first two rounds pairings played today.